Fayetteville Village Hall is located at 425 East Genesee Street, Fayetteville NY 13066; phone: 315-637-9864. Photo: Levi Snell House, ca. 1855 & 1946, 416 Brooklea Drive, Fayettevile, NY. Listed on the National Register of Historic Places in 1987. Photographed by User:Crazyale (own work), 2011, [cc0-by-1.0 (creativecommons.org/publicdomain/zero/1.0/deed.en], via Wikimedia Commons, accessed May, 2014. 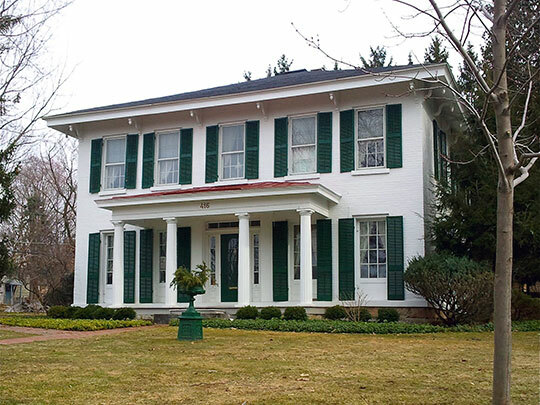 Fayetteville, on Limestone Creek, two miles northwest from Manlius, and one mile from the Erie Canal, with which it is connected by a navigable feeder, was incorporated May 6, 1844. It is finely situated on a gentle elevation, and has a number of valuable water privileges formed by the Ledyard canal (which was built by the citizens at a cost of $35,000,) and Bishop Brook. This canal is formed by dividing the waters of Limestone Creek, two miles south of the village, and that in connection with Bishop Brook, which runs parallel to it through the village, make 12 water powers, with an average fall of 20 feet each. It contains four churches, a graded school, a bank, a printing office and several manufacturers. Among the latter are a large flour mill, a foundry, a bedstead factory and a large paper mill, manufacturing news, book and wrapping paper. There are also mills from which are sent out an immense amount of water lime. The population of Fayetteville in 1865 was 1,480.